The Pre-Fast Preparation for Cycle 7 starts this Monday!!! We are finally here. The Pre-Fast Preparation Period starts this Monday! 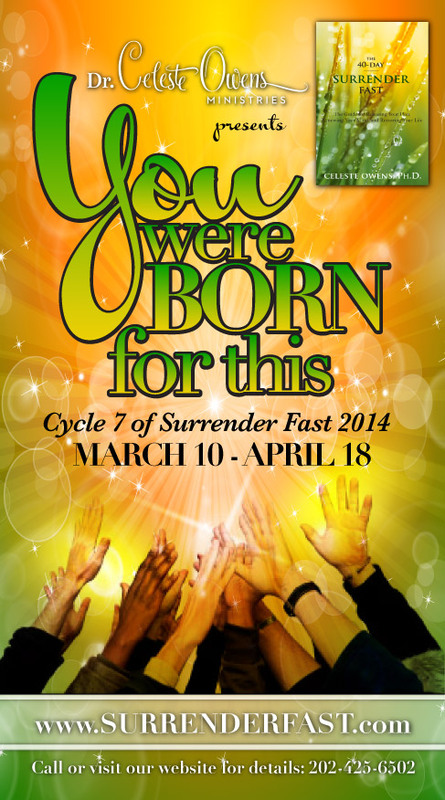 You are to read the first 5 chapters of The 40-Day Surrender Fast before the start of Day 1 (March 10). While I am in great expectation of what God will do, I am rejoicing for what He has already done! The testimonies that have come in, are INCREDIBLE. If God’s working like this now, what will happen when we start! Also, please continue to invite others to fast with you, especially members of your family. Lastly, if you still need to order The 40-Day Surrender Fast you can do so by CLICKING THIS LINK. The Children and Teens are Surrendering TOO! Teens will pray Sundays at 4:00-4:30pm (EST) starting March 2. The children’s PRAY DATES are every Saturday at 3:00-3:15pm (EST) starting March 8.